It was another hot one today. The last few days have been really adding up the heat. I think it’s Thursday evening now before they say it will be better. I like summer and the heat, but I’m really getting worried about what July will bring if it’s in the 90s now. I did voluntarily go back to work. Not sure I was ready, but you have to pay the bills. For that, I work at Motorola. Everyone seemed glad to see me back. I jumped in with both feet and tried to pick up where I left off. Not too much changed and I was able to keep up with the conversations without getting that glazed over look in my eyes. My intern was still there. I think she is finding the idea of what we do exciting. My plan to get her started with some actual writing this week. Technology hasn’t been too kind to either of us and we’ve been battling just trying to make our computers, emails, and the intranet sites work. Maybe next week will be better. Sascha is back to enjoying her yard and patrolling for squirrels. One evening, Rich tried to bring her into the house. He came back and said that he didn’t realize that dogs had a middle finger. From that comment, I take it Sascha made it very, very clear that she had no interest in coming back in. There is something grand and majestic about a husky that gives you that look when they want you to go away and leave them alone. Sascha does it very well. On Saturday, we met the Streeters’ Car Club to do the bi-monthly trash pick-up on our designated stretch of Bull Valley Rd. We had way more people than we needed, but the more the merrier. We had a couple of newcomers join us. So I got to meet some new people. We were done in less than an hour. However, we couldn’t join them for lunch this time. Rose was coming to visit today. We got back to the house and Rick had already left to pick up Rose. Guess it turns out that JP was coming with her. His plans had changed for the day. Rich and I showered and changed into clean clothes to meet our guests. Rick delivered them safely to the house from the train station. Rose walked into the living room and saw the big red chair. She immediately had to have her picture with Sascha in the big red chair. For those who don’t know or don’t remember, Sascha has been pretty well trained to think that the big red chair belongs to her. If someone sits in that chair, Sascha believes it is OK to sit with them, on them, or around them. Rose remembered all the photos of us and others with Sascha and had to have her picture also. Sascha, of course, obliged right away and hopped right into the big red chair. Since this is her favorite thing, Sascha seems to smile the entire time that she is in the chair. I snapped a picture for Sascha’s Facebook page, that Rick is constructing to capture the Big Red Chair Moments. Rose gets picture with Sascha in the big red chair. We went out to lunch and then Rich took JP and Rose for a ride in Sally. That was two trips because you can only take one person at a time. So JP went for a ride first. Then I quizzed JP on his new job while Rose took her turn. I understand technology and what’s going on out, but I don’t really know anyone doing the cool stuff. Except JP, that is. It was getting late and we had to drop the two of them off at the train station for their journey back downtown. The three of us headed to the outskirts of Chicago for a graduation party. Donna and Norm had two sons graduating. David graduated from college and Kevin graduated from high school. Donna is Rich’s cousin. It was a chance to hang out with family and we meet some of their very nice and interesting friends. Sunday was Father’s Day. Rich headed out early to get in some fishing time before the boats hit the river here. It turns out, you have to get their early before everyone brings their dogs down to swim in the river. No catches, but Rich had a lot of nibbles. He thinks they were waiting for the bait to get soft and then they could take without much trouble. 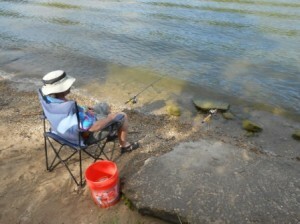 Rich has been working on a strategy for catching carp. I guess these are some wise and difficult fish to catch. They are bottom feeders and it takes a different strategy to get them interested in the bait. This means that Rich has been developing his own recipe for carp bait as well. 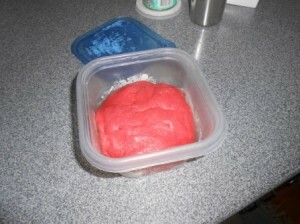 A little messy to make in the kitchen, but the results could be rewarding. Not playdough; that's carp bait from a secret old country recipe. Rich spent his Father's Day morning by the river waiting for the fish to bite. After fishing, Rich and Rick worked on the truck some more. The air conditioning went out last year. This meant that the warm weather was a little less enjoyable if you had to drive the truck instead of the Honda. We got it looked at and an estimate for the work. The guys decided to do it themselves. It meant some replacement parts, but those came in on Friday. While the guys were working outside, I was trying to clean up the drifts of Husky hair that had been floating up and down the hallway all week. That dog can drop some hair. There might have been enough to two dogs there. I was vacuuming the bedroom, but coudln’t get Sascha out of under the bed. I managed to coax her out and put her outside. After I got done, I went to bring her in. However, she seemed to be enjoying watching the guys work. Therefore, I got the majestic death stare and she went back to observing her other humans. Fine, I can go about my business then. I finished up inside and went outside to try and reclaim some of my gardens from the wilderness. My side garden had been hopeless before I left for vacation. It was an extreme case now. I mowed the general garden paths with the push mower. Then I set about to pull the weeds from my daisies. With that done, I pulled out the weeds from the butterfly garden. Most of my black-eyed susans had been lost to the weeds. I might have to replant to get them back. Time for dinner. Rich cooked the steaks while Rick got the mushrooms done along with the baked potatoes. Adding a salad to the bowls, we dug in. After working so hard, we were all hungry. Maybe not me so much. Over vacation, I had cut down on the amount I was eating. I hope I can keep that up. It would be good for the waistline. Besides that, it meant that Sascha could have some bits of steak. She seemed to agree and ate it down. Now I can relax this evening and get ready for the week to start all over again. I’m already tired just thinking about it! Remember I told you about the Kiwis on Tour that showed up at Bonnieville Salt Flats while we were there? Rich found them on Facebook! Here is a link to the group we saw that day. So I’ve almost put in a full week at work. My mind isn’t quite ready to accept the fact that I’m sitting at a desk and not out walking around a forested area somewhere. It seems unreal. I know I’ll get used to it. I just don’t want to. My minions did very well without me. This was the first year I truly monitored email and didn’t just in to do anything. They have all gained enough experience to move forward without me. Like Beth said, ‘The Taos Plan is in effect!” That means I could retire and move to Taos, NM and the department would be able to continue to operate. That’s all I wanted. I have an intern that I was able to bring in this summer. I was hoping to give someone experience in the Technical Writing field. There just aren’t that many people willing to share what they do for a living in this field. How are others going to know what it is and keep it alive! Candyce is working out well so far. I’m hoping to give her a project and start making progress. I had things I was supposed to say here, but I didn’t write them down. Darn, that’s why I make notes. I can’t remember anything anymore. Rick came back and starting finding his friends. Tyler has been over a couple of times. On Tuesday, he spent the day with his girlfriend, Jordyn. I didn’t see him, but I heard him return that night. On Wednesday, he went kayaking with Tyler and Topher. The brought Topher’s kayaks to our lake down the street. When we got home from work, they were just returning with a load of pizzas and other food. They then settled in the basement with the PS3. Sascha is happy to have us back. Today, she thought Rich and I were staying home. She was playing around the living room with her toys. When she realized we had coffee and were headed for the door, she put up her ears and questioned the sanity of that action. Not sane, but necessary to pay for dog chow. I spent Sunday through Wednesday working on organizing and creating photo files so that I could share our vacation with everyone. The last set were posted and ready for viewing by 10:00 PM on Wednesday. I sent out an email to family and friends. Another email went out today to my co-workers and work friends who might be interested. So I need to start thinking about what I want to do next year and starting making a plan on how to do that. Rich mentioned Glacier National Park in Montana since we go every 10 years and next year we are due. I wanted to do Great Smoky Mountains and Outer Banks. Now I’m thinking maybe a bunch of little vacations to places around that I can reach within a day. This could also be the year to visit John up in Alaska. We’ll see what I come up with. My garden didn’t do too badly. Most of the plants are still alive. We’ve not had much rain and I’m watering things to keep them up and off the ground. This weekend has a good chance. But it’s supposed to be hot as well. Well, I can actually do something I want tonight and sit at the computer. So I’m going to do just that. Good night. For the last time on this vacation, Rich woke up again. Today is the last day on the road. We have to get from Des Moines, IA to Holiday Hills. The day was going to prove a warm one, so the air conditioning was on from the start. No hanging either arm out of the car window for extra bronzing. We made good time, even with construction on the way. We hit the Quad cities on the Mississippi River. We stopped at the Illinois Welcome Center. This overlooks the Mississippi. Not much else there. We headed into Rockford to eat at one of our favorite places. The Machine Shed used to have the best chicken livers, but now they are reduced to an appetizer, except for Sundays. Still the food is excellent and the sides are served family style. We got our fill and moved on down the road. At least I was going to have to fix dinner tonight. Did I mention that we had stopped here several years ago from our Colorado vacation and evacuated a stray lizard who hitched a ride from Colorado Springs? I’m pretty sure he doesn’t still live here. We got into home about 3:30. Now came the task of unloading the entire car into the house before anyone could relax. Rich turned on the water to house so we had flushing toilets. Finally, the car was empty. We could spend the next day or so putting things back where they belong. My first order of business was get the laundry started. I only ended up with 3 loads to clean everything, and that included the new t-shirts purchased on the trip. I got things folded, but not quite put away. Tired and exhausted, it was good to fall into our own beds and sleep deeply and long into the morning without having to think about driving to another city. I actually even slept in, too, which was unusual. Sunday morning, we made coffee and read the paper like any other Sunday. Finally, it was time to call and get a pick up time for Sascha. Virginia said I could get her at 11:00 when her bath would be done and she would be dry. Apparently, Sascha had a hot spot on her side. These are just little sores that come up from something. They aren’t sure what. The kennel had treated it and she only had a scab now. Something I need to watch her for. 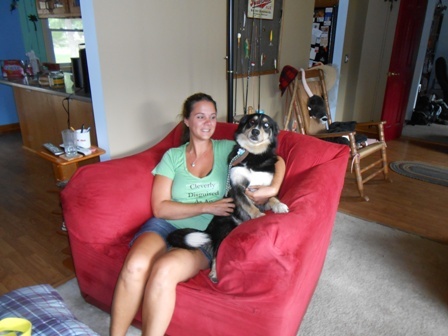 Come 11:00, I went into the kennel and picked up Sascha. As soon as she came through the door, she was so excited and about knocked me down to get a hug. The girls there and I talked and they praised Sascha highly for being such a good dog. They all think she is so beautiful. We got home and Sascha dived for her toys before greeting anyone else. Then she went off in search of Rich and planted big kisses on him. She is definitely a Daddy’s girl. It was really hot out there today. I kept going outside to warm up from the air conditioning, but there was only so much you can take out when the heat is this high. I think it topped out at 93 here. Sascha wanted to be outside, but it was too hot for her. I drug her pool out from under the deck and filled it. She loves her pool. She would play in the water and then go out into the yard. This was repeated several times. Rich did BBQ chicken on the grill and we ate well that night. Even Rick’s friend, Tyler, joined us for dinner. It’s been a while since we’ve seen him. Tyler and Rick were hanging out for a while on Sunday. I spent the day pretty much getting all of the vacation pictures from Rich’s camera and my camera into order and creating files I could post. Then came the task of actually posting them. I only got two folders done by 9:00. Time to call it quits and work on the process over the week. Be looking for a link soon to my Picasa site. Another vacation done. It was a great one. Now I have to start planning next year’s. Wonder where in the world we should go? Diane: I still owe you a happy picture of Sascha with her people. Yet again, Rich woke up. From our drive yesterday, you remember that we beat it out of Colorado ahead of some pretty nasty storms. We had heard on the TV that tornados had touched down outside of Ft Collins and Greeley. Our hotel for the evening turned out to be a renovated thing from the 1950s. I was reluctant to go in, but this is where we had reservations and everyone was standing in line. I signed in and got the key for the room. It was an okay room for the night. You would think that a Best Western would be safe. There was a lady at the desk when I got there. It was hard to tell what she looked like. She was small in stature with a ton of white hair and dark clothes. She spoke kind of slurred and in funny tones. She apparently was getting two rooms, one for herself and one for her driver. That must have been him out in the Mercedes outside. She said they were driving from Connecticut to California. Was she someone famous or just strange? 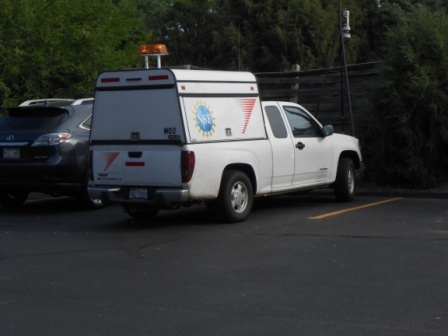 This morning, we went out to walk down to breakfast and the parking lot had several vehicles from the National Center for Atmospheric Research. These are the guys who are the professional storm chasers. Dr. Josh Wurman was sitting off to the side with someone and a computer going over data. Dr. Wurman invented the Doppler radar on wheels to chase storms. You might know him better from the show called Stormchasers on the Discovery channel. He’s the guy that gets to tells Sean what to do and usually yells at him. All I got were pictures of the trucks, but no people. We had what breakfast we could find at the hotel and headed out for the next stop. The road construction was pretty frequent and that slowed up down some. We stopped for gas and lunch, but kept moving east. Tonight, we planned to stay in Des Moines, IA. This was expected to be a 7 hour drive. We arrived to find that our hotel was very nice with all the amenities that we had planned. Then it was time for dinner. We had been through here last year on our way to New Mexico and found this BBQ place with awesome food. Rich liked it for the pickles. Cactus Bob’s was off the next exit and we headed down the road to check it out again. Before we got in the door, we could smell the food. It was heavenly. However, we had to then decide how hungry we were and what we could eat. I got the The Big Pig, which was a pork sandwich with beans and baked apples. Rick just got chicken strips because he wasn’t that hungry. Rich got chicken strips and ribs with slaw and apples AND a chili. I ate all of mine. It was still awesome. Rich just had to buy a jar of their pickled pickles. He assured me they were sweet and not dill. I took one bit and about spit it out. I hate dill pickles! I threw the other half on his tray. I think he thought I was throwing it at him. Yes, you could taste the sweet and sour, but the dill was definitely there. I won’t be stealing any of those pickles. Well, with the drive, it was a slow news day. I did have pictures though. Tomorrow will probably be barren of photos, but we will be home. This is one of the chase vehicles for the National Center for Atmospheric Research. 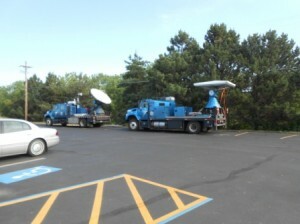 These were the Doppler radar trucks used by the National Center for Atmosphere Research teams. Rick trying to eat his BBQ choice at Cactus Bob's. 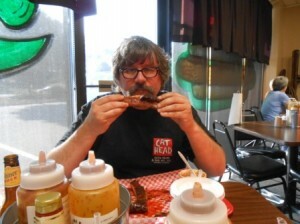 Rich was pretty quiet while he was chowing down on his ribs. 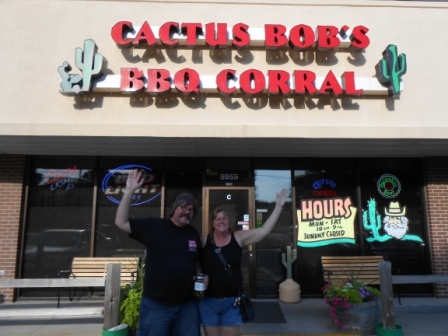 Rich and Joy doing a double Rose pose outside of Cactus Bob's BBQ. Vacation Day 16: Wagons Eastward Ho! Addendum: Added a paragraph below on Rick and the swallows. Yesterday, we had a long driving day. Rich had wanted to stop and see the Colorado National Monument Park just outside of Grand Junction. We decided that since our drive today was shorter, we would take the time to go through the park. This meant we would get into our destination later, but we hoped it would be worth it. And I think it was. We stopped by the Village Inn for breakfast. We’ve eaten at this chain before while in Colorado. They serve a pretty good choice for breakfast. Today, our waitress seemed to be overwhelmed. We got coffee and finally got breakfast, which was as good as always. We pulled up to the booth at the park entrance to find a very baby-faced young man. When did they start letting 12 year olds man the park booths? Man, am I getting old when I admit that I just said that. He took our pass and Rich’s license. He was totally amazed that we were from Illinois. You would think he sees visitors from all over. We drove up the winding road to the Visitor’s Center. We seem to do winding roads a lot on the trip. The ranger at the center had all kinds of helpful information. We picked a trail to walk and figured out how to see the park in the time we had. 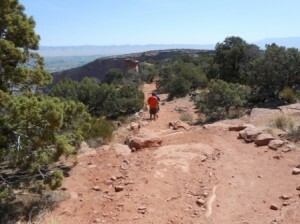 We walked down to the cliff face on the Window trail. This took us out to an overlook where you could see most of the park’s famous formations. It was really beautiful and you could see the Colorado River winding its way through the valley just outside of the park. The heat of the day was coming on and it was really dusty. We returned to the Visitor’s Center to fill up our water bottles and continue the drive around the park. We hit most of the major views, but most had trails that you had to walk to see anything. After the second one, I stayed with the car while the guys hiked out onto the cliffside. Along the way, we were walking with the same people as they drove to the same stops we did. There was a young couple with Arizona plates. From their voices, I assumed they were Middle Eastern and probably tourists as well. Another couple had Illinois plates on their car. I assumed they were from Illinois and asked where they were from. In a dismissive tone, she answered back that they were from Ohio. The Colorado couple was full of helpful information though. They lived in the area and hiked here regularly. 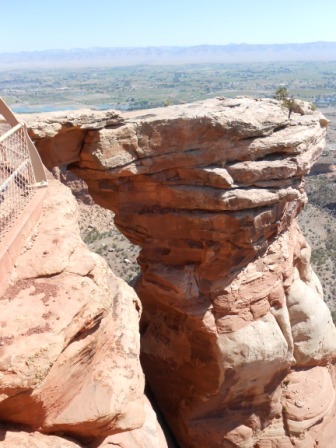 At one of the formations, Rick was standing at the railing on the cliff edge. A swallow suddenly swoped by him and he jumped. He said that it sounded like a jet going by him. I waited for one to go by me and sure enough, it had quite the high speed sound. I think they were checking us out for the bugs that they were eating. They go so fast and it was a little disconcerting to hear the swoosh. We finished our tour of the park and headed back to Grand Junction to fill up our gas tank. Then it was back onto 70 East and toward Denver. Through this part of 70, you go through all of the ski resort areas. It is beautiful, green, and winding. There were lots of expensive looking resorts and houses hanging on the hillsides as we drove by. The speed limits here go up and down, depending upon how bad the authorities think the road is. Some of the curves deserve the 40 MPH set on them. But as always, I love driving these types of roads. They are so much fun. But maybe not so much for Rich. The other cool thing is all of the tunnels that you go through. They had to get you through the mountain somehow. This was the most expensive section of road to build. Most of it is really just one long bridge to get you over the river and onto the side of the mountain. We stopped in at the rest area above Denver. The elevation here is a little over 10,000 feet. Let me tell you how hard it can be to breath at that altitude! And some people want to go higher? This was our second time at the rest stop. The first time, Rick was about 6 and there was snow lying on the ground in July that he played in. No snow this time though. We headed down into Denver for dinner. Rich has this place that he loves to go to. It’s called Günter Toody’s. It’s a 50s style diner with chrome and the wait staff dresses in 50s style clothes. As soon as we walk in, we hear someone shout out, “What’s shaking, bacon?” Yep, it’s still Günter Toody’s. One of the fun things is the way they treat you here. The first time, the waitress was snapping gum and telling us to eat our broccoli. Today, Bob was slouching on the seat beside Rick to take our order. Every once in a while, an announcement came over the PA for something silly, like “Bob, your double parked.” It’s like a running commentary for the guests. The food is really, really good here though. Rick got a Jalapeno burger and I got the meatloaf sandwich. 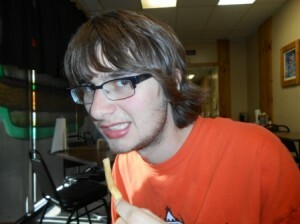 Rich got the Gunter burger with a side of Elvis fries. The fries are covered with sausage gravy and then topped with cheese. Rich said it was like country style poutine. In Nova Scotia, poutine was fries with brown gravy and cheese. He had enough fat in that to carry him into next week! Leaving out of Denver, we were racing in front of a big set of storms just to the north of us. At one point, the radar on Weatherbug was showing purple in the center with a hook pattern. We were pretty sure a tornado was going to overtake us. We managed to keep ahead of it since it was moving pretty slowly. We only had a little rain now and then. When we got settled at the hotel, the TV news was talking about the tornados that landed and the hail that fell in several areas. Luckily, the watches and warnings didn’t stretch into our part of Nebraska. The sunset with the storm turned out to be pretty spectacular when we arrived at the hotel. Everyone was out trying to capture it. Rich said it wouldn’t show up on film, so I didn’t try to get a picture myself. So that was pretty much our day. We move on to Iowa tomorrow for one last night out before reaching home again. Here is my Rose pose at the cliff edge in Colorado National Monument Park. 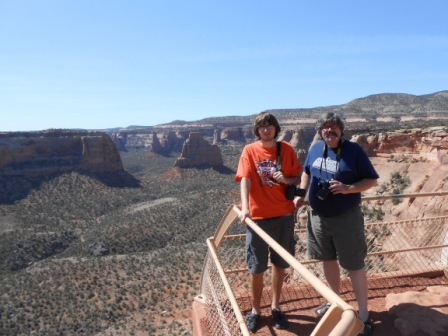 A shot of Rick and Rich at Book Cliff Overlook with the canyon behind them. I have a theme going in a lot of our hiking picures. I walk slower so the guys are always ahead of me. I usually get a picture of them. This was no exception. There was a really cool arch formation at one of the cliffs. I just had to include it here. Author joywriterPosted on June 8, 2012 Categories Uncategorized2 Comments on Vacation Day 16: Wagons Eastward Ho! You guessed it, Rich woke up today. Allergies all messed up this morning. I’m hoping it’s from the cigarette smoke and will go away. My nose and eyes keep running all through the drive. 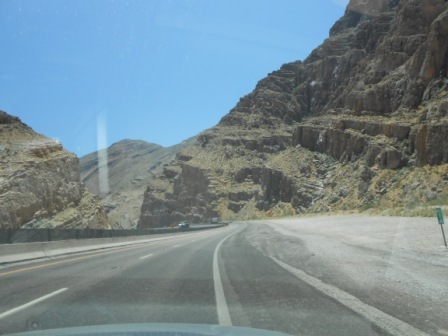 When I stopped for gas in Utah, my eyes were running so bad; it looked like I was crying. The attendant gave me a very strange look. I got the guys up at 8:00 so they could shower. We went downstairs to the café for breakfast. We were told that it didn’t open until 9:00. What the heck? That probably explains why the food court was overflowing with people trying to buy doughnuts and other items with their coffee. Who thought this was a good idea. We checked out, loaded up the car, and headed out of Vegas. Whew! We headed up 15 North toward Henderson. Rich got a place in the GPs that sounded interesting called The Omelet House. We found it with no problem. It turned out to be a very old place tucked back in a strip mall. Once you entered, you got the feeling you were in the 1940s or so. I noticed that there were signed pictures on the walls. Most of the people I knew. I thought it was cool that a lot of B stars had hung out here or knew the owners. We got a table and some coffee. The breakfast menu was this list of omelets a mile long with really interesting names. Rich got the Black Forest omelet. Rick got French toast and I settled for Country Fried steak. It was all very good. Rich’s omelet looked like it weighed in at a ton it was so large. Getting filled up ourselves, we filled the gas tank and got the heck out of Vegas. Once again, you head out into the desert to cross through Arizona and into Utah. 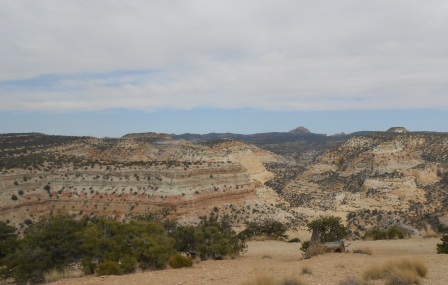 The southwest corner of Utah is one of our all time favorites. 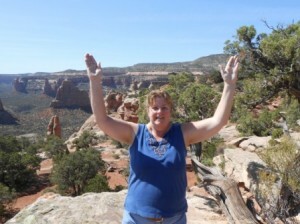 It was a shame not to be able to stop in a Zion National Park or Bryce Canyon National Park. That will wait for another vacation. Because you can see for so far out here, we could tell where a forest fire was burning out toward Canyonlands. There was thick, black smoke rising into the air. Later, the guys saw a helicopter with a water bucket headed that way. Four or five fire trucks pulled into the same station where we stopped for gas. We assumed they were filling up to head down to the fire. Utah is a long haul to get across. However, the rock formations are amazing. The landscape changes as you pass through it. I love it out here. The traffic was light and we made good time. Rich actually drove from Vegas for a couple of hours so I could stick my other arm out the window and try to burn it. Actually, my left arm is very brown and I’m looking a little uneven. I just wanted a chance to try and remedy the problem. As we were descending into one of the valleys, there was an overlook along the road. Rich wanted to stop and take a look. The view looked to be promising. I parked and got out of the car before I realized that some Indians had an entire store spread beside the entire length of the sidewalk. Rich always gives me a hard time about having to look at the Indian jewelry. I can’t help myself. The overlook had a gorgeous view of the canyon below. We walked around and took pictures. Then we returned to the parking lot. I just had to look. There was a sign that stated No Vending or Solicitation. The Indians had covered the No part of the sign with a piece of paper. At one point, a young girl came running up to me. I think she was sent over because I might not deny her request to make a purchase. I would have and should have bought something, but the guys headed to the car and I thought I had to go. Later, I found out that I could have looked and bought something. My bad for not asking first and assuming something else. While the girl was making her sales pitch, she was telling me what she knew about all the symbols that are used by the Indians in their jewelry. She had a good knowledge and recall and could answer questions. I was very impressed. I wished I could have told her how important this knowledge is. You should always know your family traditions and cultural heritage. I wish my family had passed on more of their own. We made it to Grand Junction, Colorado and found our hotel. From there, we needed to find something to eat. Now we are in Colorado, home to the homebrew association. There used to be a ton of microbreweries here. Looking on Beer Advocate, the list seemed to have dwindled. Rich found the Kannah Creek Brewing Company. I found Breckinridge Brewing, but he wanted to go with his choice. It was a little more microbrew than Breckinridge, which has gotten pretty big. We got to the brewery and got seated inside. The menu was less pub grub and more pizza, pasta, and subs. I ordered a porter, my favorite style, and Rich got one of the cask conditioned IPA. The food came out and was fine. It wasn’t the best quality I’ve had. I was disappointed with the porter. They had brewed a weaker version for the masses. Rich had the seasonal beer also. Then Rich ordered a deep fried apple pie for desert. The crust was tough, but the filling was definitely apple. So with bellies filled, we headed back to the hotel. This meant going through a roundabout. It seemed a little strange to have them in the West, but Grand Junction was filled with them. I guess they were trying them out. The problem is that drivers can’t do a normal 4-way stop so the roundabouts take some time to learning how to use. They are not intuitive for most drivers. However, it is fun to watch people try to use them. Well, another night to call it quits. We are headed in Nebraska tomorrow for the second of our three leg journey home. One of the cool things about The Flamingo Hotel was the flock of flamingoes in the garden. This was one of the photos I took from the car as we were driving through a canyon in Utah. They always impress me with their size and massive amount of rock. This was the view from the overlook where we stopped in Utah. Yes, Rich did happen to wake up today. Breakfast was at the IHOP attached to the hotel. Rich had a bad experience at an IHOP a long time ago, but it was the only thing close by. I had stuffed French toast, Rick had a bacon omelet, and Rich went for an omelet as well. We got packed and took things down to the car in the parking garage under the hotel. I went to the lobby to check out. When I returned an older gentleman in a Route 66 camp shirt was getting into his vintage Corvette. He fired it up with a very loud noise. Rich gave him a thumbs up as he drove past on his way out. The gentleman waved. It was the start of his adventure on the road called Route 66 all the way to Chicago. We got out and headed over to the building where the Naughty Dog gaming company had their offices. Rich and Rick jumped out at the light to go take a picture of Rick on the premises. I found parking around the corner and took a few minutes to let them know to walk over to where I was. Another item on the to do list was checked off. We got onto The 10 with no problem. Traffic soon became typical for LA and slowed way down. We did this until the split where The 10, The 5, The 405, and a bunch of other feeders all broke off to go their own way. It was smooth sailing out to The 15 from there. The 15 leads you out into the desert toward Victorville, Barstow, and eventually Vegas. I had done most of the work for Motorola up here. I love the desert out this way. It was good to see the area again and think about all the adventures while I was here. I saw a lot of the sites I had been at, including the mountaintop ones that were treacherous to climb. We stopped for gas and drinks in Barstow before heading in the empty space between there and Las Vegas. The wind was blowing things around, including us, and the temp was climbing into the 90s by then. Then we were off into the desert, without a camel. 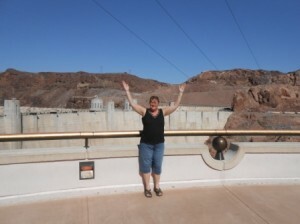 Our first stop after the desert was Hoover Dam. We got parked and found out that the tours were sold out. We did the self-guided tour, which allowed us to do everything but the generator room. 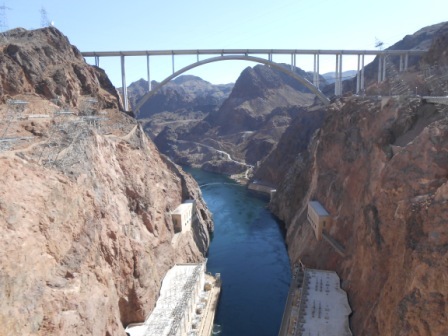 We went through the exhibit on building the dam and then out on the observation deck first for a good look at the structure and the river. 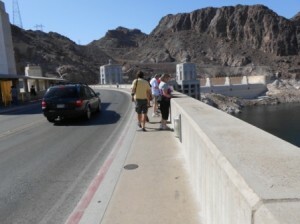 From there, we walked down one side of the dam and then crossed over to walk back. It was hot out there. But then you remember the guys building the dam in the 1930s and the fact that there was no air conditioning at the end of the day. We walked back to the spillway to see the structure that handles the overflow. It was impressive. I wondered why there were no skateboards in there. It was a good place for skating. I guess that would be frowned upon by the authorities. We took lots of pictures and I got a postcard for my kitchen display. Next, we headed into Las Vegas proper. We got to our hotel, The Flamingo,without much trouble. It took a little bit to figure out how to get into the actual hotel. It definitely wraps around itself. Once I got to the check in desk, there was a very long line. I took my place and watched the people go by. There is one of everything in Vegas. I couldn’t classify them all using my usual chart for people watching. The hotel even allows dogs inside with a special place for them to go for their duty! After 30 to 45 minutes, it was finally my turn. I got my cardkeys and a map of the place. No, there was no cart to bring up luggage with. We had a lot of things to get upstairs and it was not going to be pretty to do. We stacked up suitcases, packs, along odds and ends and made the trek to the elevators and then to our room. The first thing was the noise. There were jackhammers running right under us. I called the Guest Services to see when the noise was scheduled to stop. They told me they didn’t know since they didn’t understand why it was still going on at 6:30 PM. She assured me they were working on it. Thanks, Alex. You recommended the place. We went down to the buffet to eat before striking out on the street. The flamingoes were in the garden eating and generally entertaining guests. We could see them while we wait in line. Two gentlemen in front of us started up a conversation. They wanted to guess where we were from. One guy was Indian and the other an American. They threw out Indiana, but I believe they had been listening to me talk before they started a conversation. My guess is the Indian gentleman knew something of linguistics and was using it against me. That’s fine. We had a good conversation before we got seated. After dinner, we went out to walk the strip. 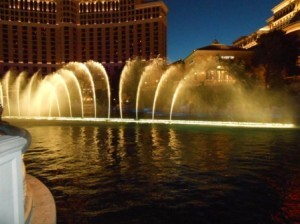 First, we went to the Bellagio to watch the water and light show. It was impressive. 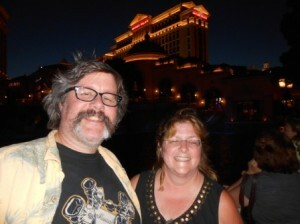 Then we walked down to The Venetian so I could see the canals. 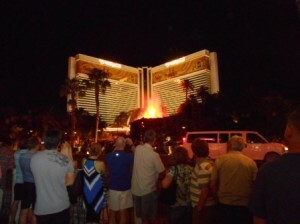 While we were looking, The Mirage lava show went off and we watched from across the street. We could feel the heat from here and there were people right under it! As we walked down the street, it became a wave of people surging against us. We felt like salmon swimming upstream to spawn. Later, we figured that the crowd was coming from the pirate show at Treasure Island trying to get down to The Mirage for their show. After seeing the canals, I was trying to find out from Rich what we should see. It took a bit to get that the Grand Shoppes in The Venetian had an interesting motif. The shop area was arranged as squares in Venice with painted skies above. One square even had an evening sky at dusky. That was truly awesome. 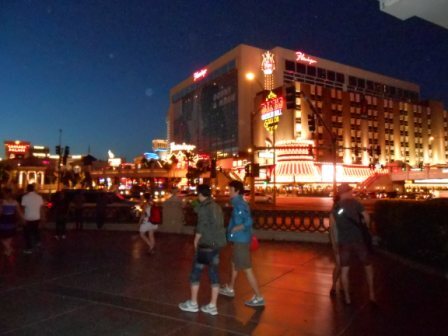 We then decided to go back to the Flamingo, where we were staying. But we couldn’t find the exit! The hotels are all set up to take you through the casino floor to allow you access to anything else. 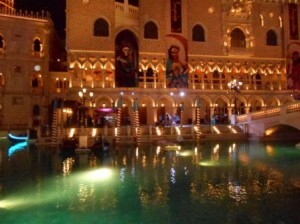 We found an HP convention in The Venetian, but it appeared to be all Japanese attendees. Finally, Rick found the hotel front desk and we made our escape out the doors. Walking in the street wasn’t much better than before. It was crowded with a lot of pushing and stopping. And the cigarettes and cigars! I could only cough and try to stay away from them. I grew up in a house with a smoker (my Dad). But once he stopped, the smell of cigarette and cigar smoke only makes me nauseous. I can stand some pipe smoke though. My grandfather was a pipe smoker and it brings back good memories when I smell it. 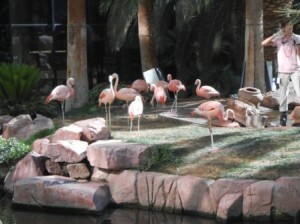 Back at the Flamingo, the jackhammers had stopped! I wanted to log in and try to post Day 13. Rich tried to log in with his Nook and found out that they were charging $14.95 to connect! No way. I could wait for a free WiFi connection the following night. So we fell exhausted into our beds. It's me doing another Rose pose in front of the Hoover Dam! It was a long way down, but the water looked so beautiful. It was really dam hot one up here. Rich and Rick walking across the Hoover Dam. It's a little bit of a walk in the heat. I was across the street from our hotel, The Flamingo, to get this shot. Just an example of the water and light show at the Bellagio. It was beautiful and the choregraphy with the music was great. Rich and I were having a good time in Vegas so far. The canals were beautiful. One girl even stopped her gondola to seranade the crowd. 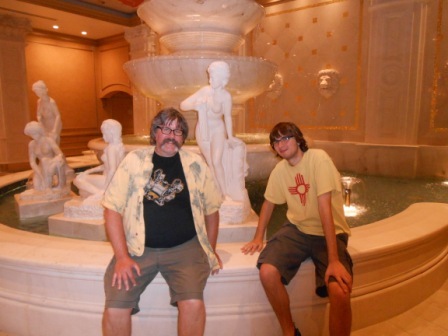 Rich and Rick with the stone beauties at the fountain in The Venetian. We were across the street, but you could feel the heat from the water being pumped with the flames for the lava show at The Mirage. I’ve started this blog early, so Rich isn’t awake yet. I’m sure he will be in a half an hour. For those who don’t know, Rich told me that the most important event every day has been that he woke up on the right side of the grass. I woke up early today for some reason. I didn’t hear anything in particular. This is my usual time back home so I might just be getting back into the mindset. I put on my robe and grabbed some things to go set out on the porch. I figured I would moisturize and read. I get on the porch and what do I see? There is a small herd of deer feeding right in front of the lodge. I dashed back into the room to grab my camera. Who knew there was a photo op this early in the morning. I started taking pictures when I realized there was a stupid woman with a camera chasing them down the hillside. Doesn’t she know to take pictures, but not to disturb the wildlife? She kept walking toward them trying to get closer. I guess she doesn’t understand the danger of an attacking deer. Too bad she didn’t find out either. The deer finally gave up on breakfast and took off down the hill. As I sat reading on the porch, a Japanese family came out of their room talking at the top of their voices. I shushed them and they nodded and went right back to talking loud! It was 6:00 AM here! They proceeded to the parking lot and were yelling back and forth. I’m amazed at the number of rude people in the world who don’t stop to think about those around them. Hotels seem to be the worst place. I guess we all have our moments though, don’t we? Today, we leave the wilderness for another type of wilderness. We are headed to Santa Monica. First, we are going to the LeBrea Tar Pits and the museum there. Then we are going to the Santa Monica pier. You see this so much in the movies and TV shows. It’s cheesy, but memorable. Rick has to go to the Naughty Dog offices to get a picture. They make one of his favorite games. We are meeting Claudine for dinner tonight as well. Claudine is Rich’s cousin and she lives in the area. We’ve not seen her for a while, so we have some catching up to do. Alright, time for Rich to finally get up. It’ll be another good day! We had breakfast and packed up our room to leave. 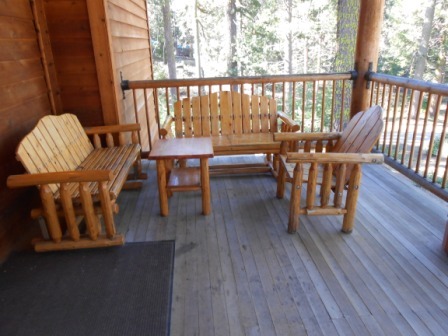 I’d like to have spent more time at the lodge and see more of the park. I like Sequoia. 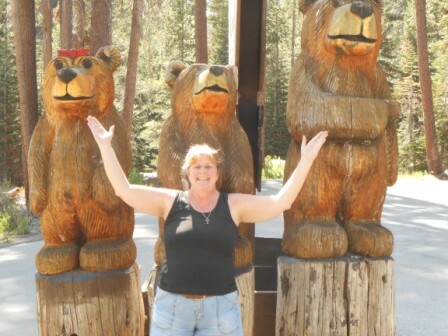 It is less overwhelming with things to see and do than Yosemite. At least we had phone service if not WiFi here! My plan was to head through the south gate of the park. This was going to tack on more time, but I felt like it might be worth it. 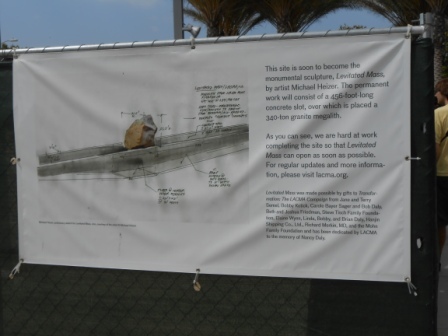 Unfortunately, there was major construction on the downhill slope leaving the park. We had approximately 5 or 6 miles of one lane road. Crews were installing retaining walls on the roadside. It was cool that they had dug out the side of the mountain getting a solid footing for the wall and then was backfilling the dirt and rock back in. It’ll be a nice safety feature. To get out of the park, we continued downhill until we hit the flat land of the fruit and vegetable farms in the area. From here, we took a smaller highway down to Bakersfield so we could hit The 5. Rich notes that Bakersfield is the home of Merle Haggard and Buck Owens. That’s nice, that’s real nice. In the LA area anyway, most of the major highways are referred to as The. Or least they had been when I was here. So you say The 5, The 10, The 405. Maybe it’s to emphasis their importance in the scheme of transportation out here. Anyway, we get on The 5 and head up the mountains towards LA. Not much to say about the drive. The mountains are pretty cool. I was looking for cell sites where I had worked in the area. A few of them are actually still standing, just maybe not used anymore. As we climbed the mountains, the clouds were coming over the top and spreading out into the valley below it. We could see this from a distance and it looked kind of strange to watch this white stuff spread out and cover the face of the mountain from view. There was a front earlier in the day in Santa Monica that was supposed to bring rain. Figured these were the clouds that were part of the front as it moved north. Driving in LA isn’t really any different than driving in any other large town. There are just more cars and a couple of other rules you have to remember. Motorcycles can legally drive between lanes on the expressway. I had forgotten about this when I got into traffic and one went whizzing by me. It’s great if you ride a bike, but the commuters didn’t like it much when there is gridlock or you change lanes. I remember being stuck in traffic once and everyone was opening their doors to block the lane. It was kind of like, we all go or no one goes. Getting to the LaBrea Tar Pits meant going into Hollywood. So we took the Hollywood Freeway. That’s The 101 in highway label speak. The 101 is really old and kind of narrow. It’s not the nice big 6 or 8 lanes. It has lanes, but they are narrow. The traffic also continues to move just as fast as the larger expressways, too. We found our exit and were in the heart of Hollywood. There were tourists everywhere! Luckily, we got through this part of town. We found the museum district and the tar pits on Wilshire. This part of town was looking pretty worn these days. I remembered it being more upscale. But then the Beverly Wilshire Hotel and Rodeo Dr. were a little further down. We circled the complex and found the parking lot. 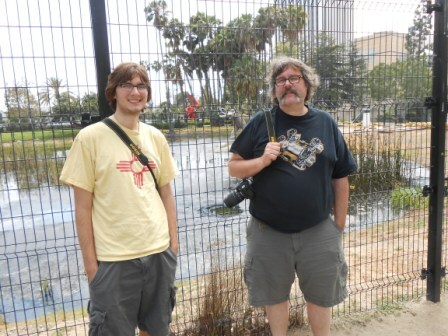 Gathering up cameras, we prepared for the hunt in the tar pits and the adjacent Page Museum. 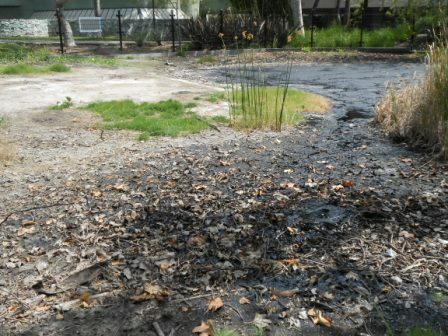 The complex has several tar pits. We looked through the fence at the famous one that you see when they have anything on the pits. Sadly, they have to restraint people from diving into the black gooey waters. The pit bubbles as it releases gases still trapped in the tar. This pit is kind of cheesy with its statues of extinct animals that were found in the pit. The other pits are more interesting. These are working excavation sites, but no one was there today. You could see fossils protruding from hardened tar with tools ready to dig in and release them. Pit 91 had a nice enclosure with an observation deck. This is one of the few in ground pits they are still working. 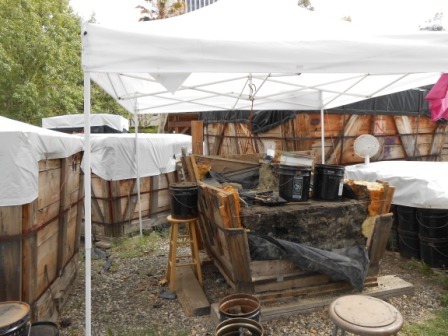 Pit 23 is a series of 23 crates containing cross sections of tar taken from other locations. 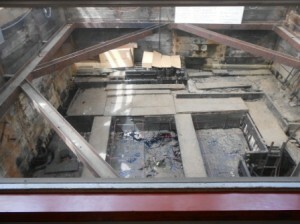 Each crate is opened and the person works from the top down to clear away the tar and find the fossils inside. The Observation Pit was closed at this time of day, so we didn’t get to see what was in there. Now the Los Angeles County Art Museum is right next to the tar pit complex. 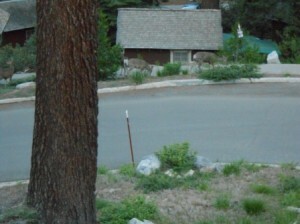 Aunt Fran had asked us to be sure and see the large boulder that had been moved from San Bernardino to this location. Since it was so close, we walked over. The boulder was covered in a large parachute, so we couldn’t really see it. 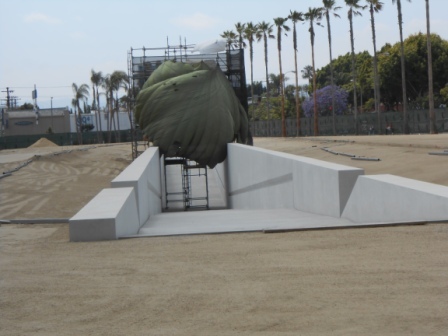 The rock is part of an art sculpture being installed called, Levitation. The sculpture consists of two concrete structures acting as rails for the rock and then you should be able to walk under it. Kind of a cool idea. I’ll have to get more info on the rock itself. There were gardens all around the pits and museums. Everything seemed to be in bloom. I had a hard going from one thing to the next without looking at the flowers and trees. There appeared to be a locust tree with large blue or purple flowers. I found it fascinating that a rather large tree would have purple blooms. These are usually white or a pale color. It was beautiful. They had rather large agave plants around the property as well. Really cool to look at. We went into the museum to see the fossils and working laboratory they have on site. Unfortunately, the lab wasn’t working. It was about 4:00 and probably time for them to leave for the day. They had several bones labeled for what they were working on. Zed was a Columbian mammoth that had been found. These were really large bones. The other animal was a saber tooth tiger named Fluffy. Time to go and find our hotel. The GPS got us onto The 10 and headed to Santa Monica. Our lanes were fairly clear, but the eastbound lanes were slowly crawling down the freeway. LA traffic at its finest. I’ve sat in a lot of that in my day. We managed to get off the freeway and find our hotel. I just had trouble finding out how to get into the parking lot! I got turned around and back to the front of hotel where you drive through the entrance and down to the parking lot underneath. After resting for a bit, we headed out to meet Claudine for dinner at Casablanca. This was a cute little restaurant with characters and scenes from Casablanca the movie. It was great. We got inside and met Claudine right away. She had gotten a table already. Because no one was willing to drive in the area, I had to pass up the wonderful little margarita cart that they rolled up to the table. They made the most wonderful looking drinks. So we ordered food and talked and talked and talked. Gotta warn the family here, we did gossip about you all. We had to get Claudine caught up on where everyone was, who they were with, and what was going on. After all, she is family. We talked about Busia, too. Claudine knew exactly what Rick wanted to do with his career. She apparently works with people who do UX. That’s User Experience. I never heard the acronym, but it fits. That was cool that she understood and knew something about what was going on. After dinner, we said good-bye to Claudine and went to see the Santa Monica pier. This part of town was really busy. It was hard to find parking, but I finally got to a lot within walking distance. We got out to Santa Monica Blvd and walked toward the ocean. At the Third Street Promenade, there was music, food, and people galore. It was really busy with everyone walking up and down the closed street. We got down to the ocean and walked over to the pier. Duh, there was parking right at the pier and plenty of it. It was a little costly though. So Santa Monica pier is technically the end of Route 66. Now the guys can say that they have been at the start, some of the middle, and at the end of it. Things were closing up, but the crowds were still flowing in. We walked to the end and back. Along the way, Rich became fascinated with a bird on the side of the pier in danger of being washed away. There was some unusually high tide expected into the beach in the morning. The waves crashing in were really high and hitting the beach much higher up than expected. A lot of people were playing in the waves and trying to see where it would get them. Fortunately, the bird didn’t get taken out while we were down there. We walked back up to Santa Monica Blvd. The crowds were moving around us. You could get hear all kinds of languages as people walked by. It was almost like being in Yosemite again. Unfortunately, there was some guy peeing in the street. I think Rick and Rich got turned off by the grunge and feeling a little unsafe. We weren’t in the worst part of town though. We made it back to the car in one piece and back to the hotel to settle in for the night. Tomorrow, we leave for Las Vegas. My camera was tired before we left to must Claudine. It kept telling me the battery was exhausted. So I let it rest up. Deer were feeding in front of the lodge this morning. I had to run back in to grab a camera. Just to cheat a little bit, an older gentleman came down to the garage in the morning as we packed the car. Wearing a Route 66 camp shirt, he got into a vintage late 1970s style Corvette with a loud engine. He was beginning his trip down Route 66 to Chicago. We would too, but not exactly on the same route. This is an example of the porch where I was sitting this morning. Only mine had rocking chairs instead of gliders. Rick and Rich standing in front of Pit 1 at the LaBrea Tar Pits in downtown Beverly Hills. I always wanted to see this place and now we are here.They use large Saber Tooth Tiger paw prints to lead you through the site. This is probably their most famous animal to date, besides Zed. Pit 91 is enclosed as they dig through the layers that are still in the ground. Flags indicate where fossils were dug out recently. This is one of the pits where the water has dried up but the primordial tar keeps oozing up expelling gases. Pit 23 is actually a collection of 23 crates that contain sections for another site where they had to take them out of the ground to get them out of the way for construction to begin. The volunteer sits on top of the crate and works their way through the contents to find fossils. Not as glamourous as Pit 91, but the ventilation is better. 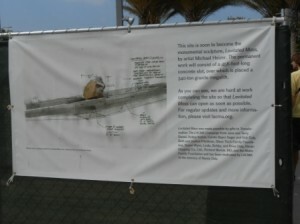 Sign at the LA County Art Museum describes the Levitation sculpture once it is completed. The mystery rock awaits unveiling to become part of the sculpture. Rich woke up again today. Just can’t say that enough. Noises start early at the John Muir Lodge. I got the guys up and moving at 8:00 to start the day. We went down for breakfast at the restaurant. Nothing big to speak of. Just regular breakfast stuff. We checked in at the Visitor’s Center and got some info on the shuttle buses. Then we headed into Sequoia National Park proper to find the General Sherman tree. 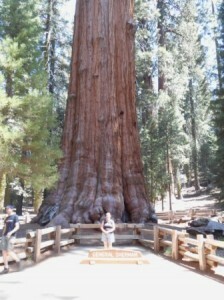 Now this general is the world’s largest tree by volume. 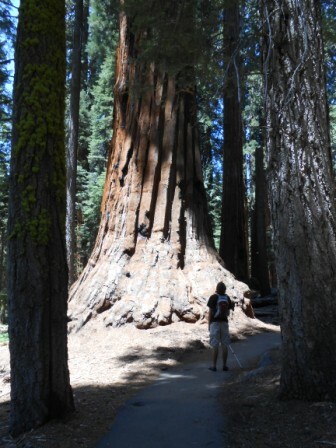 The tallest trees are in the Redwood Forest in northern California. But this general, he is big. We got to the lot and parked. At the top of the trail, there was a nice entrance. The trail leads down about a mile to the tree. Along the way, there are signs and exhibits. We saw the sign that said we were half down the tree. We looked around before we noticed a very big tree straight ahead of us and behind some smaller trees. Now that was big. Walking up to the General, we noticed a tree lying beside it on the path. Turned out, this was just a limb from the General that fell and they left it as part of the exhibit. You could touch it and it was huge. Amazing that this was just a limb and not a tree. We decided to take the Congress Trail through the groves of big trees. This trail was a 2 mile walk up and down the hills to see the other big trees that were in this part of the park. It was called Congress for the other tree names in these groves. 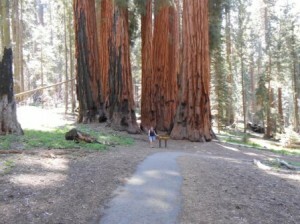 We saw the President, the Senate, the House, McKinley, Lee, and lots of other sequoias. Many of them had evidence of fire and damage. But no matter how damaged the trees might be, they only needed some part of their limbs to reach the roots to survive. They seem to do this very well. At the bottom of the trail, we caught a bus headed to the Giant Forest Museum. The bus took us by the Lodgepole Lodge and a couple of other areas. We finally made it to the museum, which was small without too much to see. 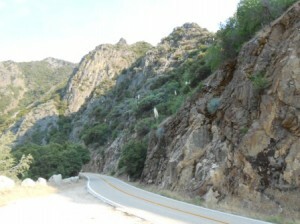 From here, we hopped a very full bus going to Moro Rock. Now Moro Rock is named for the roan horses that pastured there with the Spanish. 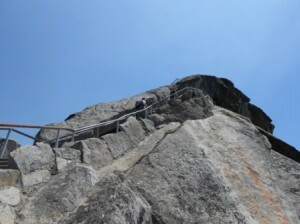 There are 400 steep and narrow steps that take you to the top of a rock formation. From here, you can look out to both sides of the valley. I made up only halfway before I decided to wait in a small area with stone seats. I had been to the top over 20 years ago, so I knew what I was missing. I wanted them to see it. Rick and Rich continued up to the top. They were gone for a very long time and I was wondering if they fell off. Rick appeared beside me before I knew it. Somehow, I missed his descent down the mountain. Rich finally caught up with us. Rick, of course, is zipping up and down the mountain with no problem. Rich and I had to take our time coming down the steep steps. We got back on the shuttle bus to get back to the museum again. However, we had to ride it around to Crescent Meadow, the Tunnel Log that you drive through, and then back to the museum. From there, we got a shuttle back to our vehicle. It had been a long day. But since it was only 3:30, we decided to come back to the lodge for dinner and then head down to King’s Canyon National Park. 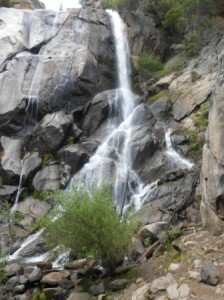 I had been down to King’s Canyon when I was here over 20 years ago. Since we had time, it was worth the trip. Now this is another downward trip to drive into the canyon. It was steep, but few cars were out on the road. Much better drive on when it is you alone. Halfway down, I hit a snake lying in the road to sun itself. It was black and white and not something I recognized. The next snake was a rattler that I missed, according to Rich since I didn’t see him. The next snake was already dead, but just a plain garden variety snake. I got a picture of my black and white one on the way back up. We got to Yucca Point and wondered why it had this name. Then you look out and realize that the mountain and the sides of the roads were covered with blooming yuccas! We stopped to take pictures because it looked like something out of Dr. Seuss. They were beautiful though. We finally got down to the King’s River and the road ran beside it. We took pictures of the rapids and some features in the river. It is a very fast flowing river. We made it to Grizzly Falls about 6:30. After taking pictures of the falls, we decided to head back up to the lodge. It seemed to take forward to get down to the bottom, but only took an hour to get back to the top. We stopped at Junction View to take pictures of the valley as the forks of the river met. The hazy wasn’t too bad today. At the top of the road, we decided to go back to Chicago stump. The road was rocky and dirt. After a mile, the sign said we had another mile to go. Nope, I gave up. I didn’t want to be stuck on this road when it got dark out. So we headed back out of the wilderness without seeing one bear. Back at the lodge, I called Claudine, Rich’s cousin, to arrange our meeting in Santa Monica the next night. We are having dinner and getting reacquainted. Should be fun. We are hoping to see the LaBrea Tar Pits, Santa Monica pier, Venice Beach, and Rick’s favorite gaming producers, Naughty Dog. As I’m typing, the guys are discussing how to attract a bear to the lodge. Someone is hooting and hollering out there tonight. They wondered if the bear got someone already. Well, good night. Tomorrow, we drive to LA and spend the night is Santa Monica. Vacation is almost over. That's me in front of the General Sherman tree. This tree is the largest tree in the world by volume. It is a mere 1,800 years old. Then the trees come in groves also. This is the Senate grove on the Congress Trail. We felt like this the whole time. They are all so tall and so big around. Truly, this was the forest of giants in Sequoia. 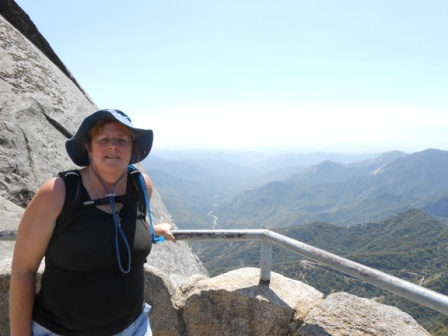 I started to climb the 400 steps on Moro Rock and only got to 200. This is me at the mid point waiting for the guys to return. Rich decided to climb all the way to the top of Moro Rock. I got this shot of him continuing the climb to the heavens. 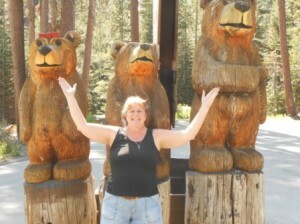 We had hoped to see bears, but these statues turned out to be the only bears we saw. I did a Rose pose with them. The yuccas were all in bloom in King's Canyon as we drove down to the river. It looked like something out of Dr. Seuss, they looked like cartoon characters. We drove into King's Canyon back to Grizzly Falls and took some pictures of the river and the falls. Then it was getting late and we drove back up to the canyon rim.